UUNET is one of the oldest and largest Internet Service Providers. Prior to its founding, access to Usenet and E-mail exchange from non-ARPANET sites was accomplished using a cooperative network of systems running the UUCP protocol over POTS lines. UUNET Communications Services began operation in 1987 as a non-profit corporation providing Usenet feeds, E-mail exchange and access to a large repository of software source code and related information. In 1990, UUNET launched its AlterNet service, which provided access to an IP backbone independent of the constraints of those operated by the government. That network lives on in a much larger form and serves as the core of a set of products which include access at dial-up and broadband speeds as well as web hosting. 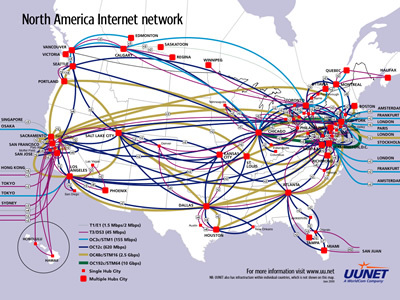 This map, from June 2000, represents UUNET's Internet backbone in North America. It shows its vast network infrastructure of Tier 1, Tier 3, OC3c, OC12c, OC48c and OC192c connections (corresponding to different bandwidths, from 1.5 Mbps to 10 Gbps respectively) as well as its major city hubs. Today, UUNET is a brand of Verizon (formerly MCI). 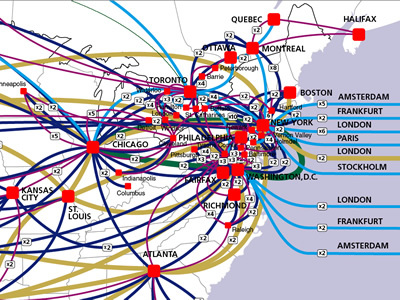 The name UUNET has lost much of its luster in the eyes of today's network engineers due to MCI's lax policies toward spam. "Tier 1, Tier 3" should probably be T1 and T3 - not the same thing!